The standard way to measure the impact of drought is by its economic effect. Last year, for example, the severity California's four-year drought was broadly characterized by an estimate that it would cost the state's economy $2.7 billion and 21,000 jobs. However, there are many experts who feel economic measures alone are inadequate to fully assess the impact of this complex phenomenon, which affected more than one billion people worldwide in the last decade. They argue that there is an urgent need to come up with better methods for measuring the overall effects of drought because the duration and severity of droughts are widely expected to increase in the future due to global warming. To provide such a comprehensive view, a pair of Vanderbilt doctoral students has assembled a multi-disciplinary team of graduate students from around the country to conduct a multi-faceted study of how people are affected by and responding to drought conditions in the United States. After all, drought is not just the lack of rainfall. It emerges from a web of interrelations between human and natural systems. So the study will go beyond purely economic measures to document unmonetized social and environmental effects, as well as identifying actions people are taking to moderate the impacts of water shortage. The nearly one-and-a-half year "graduate pursuit" project is funded by the National Socio-Environmental Synthesis Center, a venture of the National Science Foundation and the University of Maryland. Participants will receive a modest stipend and reimbursement of travel expenses plus in-kind support in the form of access to high-speed computing facilities and expert advice at the center. 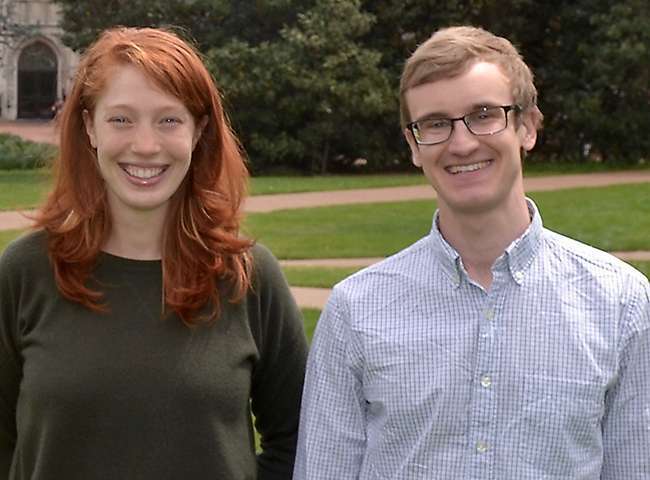 The principal investigators are Emily Burchfield, doctoral student in environmental engineering, and John Nay, doctoral student in integrated computational decision science. The two, who are both fellows at the Vanderbilt Institute for Energy and Environment, recruited an interdisciplinary team of graduate students from the University of California, Berkeley, Stanford University, Duke University and the University of California, Santa Barbara for the study. The project brings together environmental scientists (climate science, environmental engineering, and hydrology), data scientists (geographic information systems and computer science) and social scientists (human geography and economics) to isolate and understand the effects that drought has on different social and ecological systems across the country. The project will make use of an open-source software tool that Burchfield and Nay developed to automatically download data from NASA earth-observing satellites and apply advanced machine-learning algorithms to analyze the health of vegetation and generate both "nowcasts" and short-term forecasts of vegetation health for anywhere in the world. (https://github.com/JohnNay/forecastVeg and http://arxiv.org/abs/1602.06335). The team will develop a county-level database of drought events, drought effects and drought moderators. By combining the predictive power of machine learning with econometric techniques, participants will estimate the causal effects of drought on a number of socio-environmental variables and identify variables that moderate these effects. The group will also conduct case studies in a subset of counties with similar meteorological drought exposure to explore the interactions between physical, socio-economic, political, institutional and informational forces that influence a system's response to drought.